One Saks Fifth Avenue shopper got more than she bargained for, when a hand written note fell out of her shopping bag. The note was written in 2012 by Tohnain Emmanuel Njong, a prisoner in a Chinese facility who was being forced to make shopping bags. Njong’s letter was a plea for help, saying that he and other inmates were forced to make bags in the prison factory for over 13 hours a day. Stephanie Wilson went on an ordinary shopping trip to Saks in Manhattan, picking up a pair of Hunter rain boots. But when Wilson got back to her West Harlem apartment, she saw a piece of paper slip out of her shopping bag. 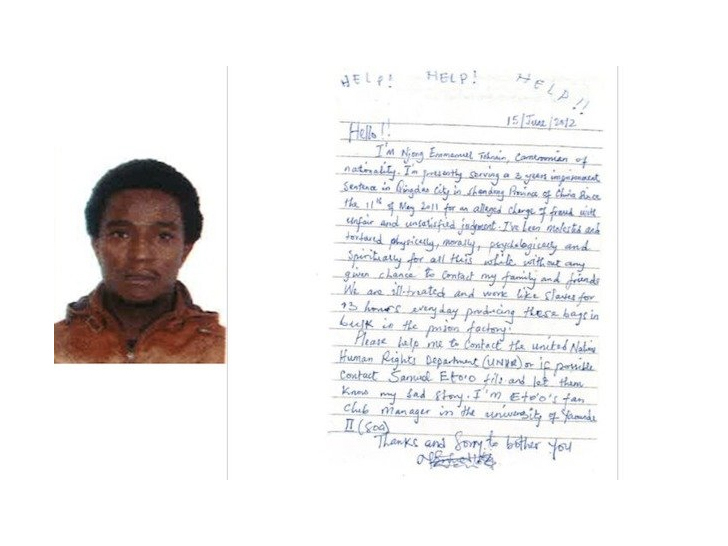 Along with the handwritten note was a color passport photo of a man in an orange jacket, presumably Tohnain Emmanuel Njong. Njong began his pleading letter with “Help! Help! Help!” The letter goes on to describe the slave-like working conditions he was forced to endure, including 13 hour work days in a prison factory, and an email address on the back. Wilson turned the letter, which traveled over 7,000 miles before she found it, over the Laogai Research Foundation to help find Njong. Taking on the research, DNA Info tracked down Njong, who has since been released and spoke with him in a two hour phone interview. Njong, who is from Cameroon, said he was teaching English in the Chinese cit of Shenzhen, when he was arrested for fraud, of which he said he was innocent. He then sent out 5 letters like the one Wilson received, in hopes that someone who hear his plea. Saks, which is now owned by the Hudson Bay Company, has begun an investigation to make sure all of their vendors do not source labor from prison factories. One Saks Fifth Avenue shopper got more than she bargained for, when a hand written note fell out of her shopping bag. The note was written in 2012 by Tohnain Emmanuel Njong, a prisoner in a Chinese facility who was being forced to make shopping bags. Njong�s letter was a plea for help, saying that he and other inmates were forced to make bags in the prison factory for over 13 hours a day.